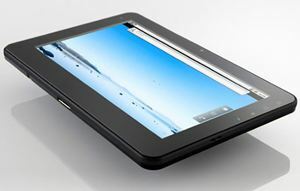 Not to be left out of tablet markets, Onkyo has unveiled its Android tablet which is known as TA117. The TA117 has been designed in two models which are TA117C1 and TA117C3. In order to reduce the cost, both models have been preloaded with Android 2.2 Froyo operating systems. The power of the tablets are booted up by NVIDIA’s dual-core 1GHz Tegra 250 chipset. The Android tablets come with a 10.1-inch touchscreen display which operates at 1024 x 600 resolutions. Featured with a 1.3-megapixel camera, both TA117 tablets also support Bluetooth and 802.11b/g/n Wi-Fi connectivity, come with two USB 2.0 ports, a microSD memory card slot, an HDMl output and connector for an optional dock. In addition, both tablets come with a battery that provide up to 6.5 hours of battery life. The different between two models are their RAM and internal storage, which TA117C1 tablet comes with 512MB of DDR2 RAM and 8GB of internal storage, while TA117C3 tablet comes with 1GB of DDR2 RAM and 16GB of internal storage. Both models of the TA117 Android tablets with dimensions of 267 x 173 x 14.8mm are expected to be available in Japan on 31 December. However, the price for TA117C1 and TA117C3 tablets are not yet announced.